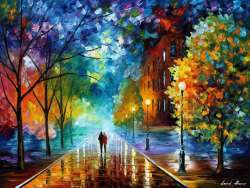 We opened this online art gallery to give art lovers all over the world a chance to enjoy and buy Afremov paintings in an easy and convenient way. But before you proceed to the first page, let us tell you a little more about this wonderful artist and his peculiar style! 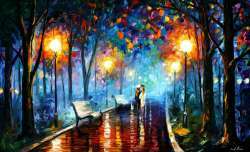 What makes Leonid Afremov paintings so special? 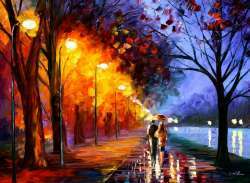 After years of creative experiments, Afremov has developed his own painting manner that makes his pictures immediately recognizable and uniquely appealing. How is it different from what we usually call art? To add volume to his works, the artist uses a very peculiar Impasto technique. By laying oil paint in thick overlapping strokes, he creates a layered texture that gives his paintings a distinct three-dimensional sense. 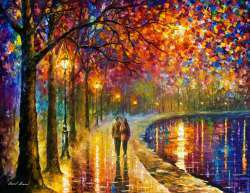 Instead of brushes, Afremovwields a rather unusual instrument called palette knife to achieve spectacular visual effects. Pressing the blade down at different angles allows him to apply strokes of different size and shape, from large chunky splashes to the finest lines drawn with the very tip of the knife. Afremov paintings strike the eye with a rich color palette. They resemble motley patchworks where all shades of the spectrum are combined into one cheerful mixture, so vivid the eye can barely hold it. That’s why people find his canvas pictures so fascinating and positive. 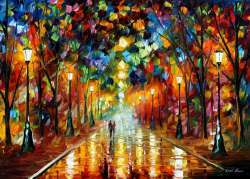 In Afremov’s manner, color obviously prevails over shape. Here you won’t find photographic details or precisely reproduced outlines. His artis the world of imagination where how you paint is much more important than what you paint. Each artwork in this gallery is a reflection of Afremov’s soul that captures meaningful moments of life in all their inexplicable charm and striking profundity. 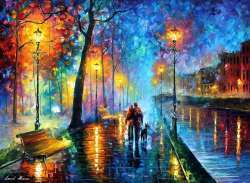 What genres and motifsare represented onAfremov paintings? 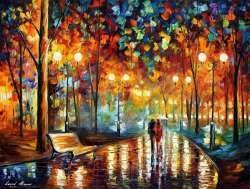 Vibrant cityscapes depicting rain-soaked streets, quiet autumn parks and lover couples strolling down lantern-lit alleys. Imaginative flower sets and still lifes. 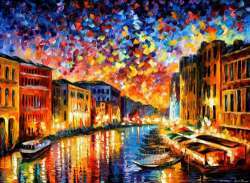 During his long and prolific career, Afremov has created hundreds of remarkable art samples many of which already found their buyers in the face of private collectors and public establishments. On the pages of his vast art gallery, you’ll find numerous paintings available for sale, from original canvasses to 100% hand-painted recreations of earlier works. While constantly producing new material, Leonid also keeps revising and tweaking his old sketches in line with his maturing vision. Even in dull copy-making routine, we see the work of his ever-searching soul. Fill your home with color and joy! 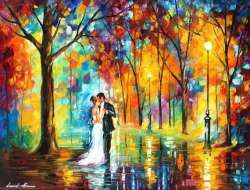 If you are in love with contemporary art and exquisite oil paints, beautiful and passionate pictures by Leonid Afremov will make a fine addition to your painting collection. They will fit neatly into any room interior, from a luxurious wood-heavy parlor to a spacious modern-style office with minimal furniture, and create a warm cozy atmosphere in your apartment. 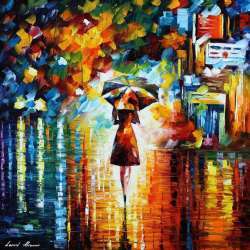 Give your place a bright twist and let your imagination run free by ordering one of Leonid Afremov paintings online and getting it shipped right to your doorstep! 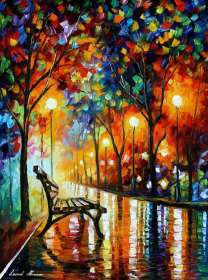 The official online virtual gallery of Leonid Afremov. Thank you for visiting my online store and purchasing my work! I'm so glad to see that my paintings are much appreciated by the ones I create them for. Myself and my team are at your services at all time! i would like to know how can i buy the paint, i am from argentina. thank you!